For thousands of years, gold has represented love, tradition, wealth, beauty, and decadence. In the United States alone, these associations cause the gold jewelry industry to be worth more than five billion dollars annually. Halfway around the world, however, the extraction and smuggling of gold serves as an important means of funding for armed groups and army commanders in the deadliest conflict since World War II. In the Democratic Republic of the Congo (“Congo”), violent armed actors mine, tax, and smuggle minerals and perpetrate widespread atrocities. Major supply chain reforms by electronics companies, coupled with the Dodd-Frank Act’s section on conflict minerals and the beginnings of a minerals certification process in the Great Lakes region of Africa, have led to a marked improvement in the security situation at tin, tantalum, and tungsten (3T) mines in Congo. Over two-thirds of the eastern Congo’s 3T mines are conflict-free today. Gold, however, remains a major financial lifeline for armed actors. 98 percent of artisanally mined gold—estimated at between $383 and $409 million in 2013—is smuggled out of the country annually, and much of that gold benefits armed commanders. Gold sold by armed groups into the global supply chain ends up in various products, including jewelry, which is the main overall end user of gold. Conflict gold thus taints the industry as a whole. Fortunately, jewelry retailers and consumers can play important roles to help end the conflict gold trade and the suffering it causes, together with the actions of governments. Corporate and consumer behavior can lead to increased demand for responsibly sourced, conflict-free gold and promote investment in positive mining initiatives in the region. As the largest end-user of gold, making up around 45 percent of worldwide gold demand, jewelry companies have the ability to increase demand for conflict-free gold from Congo and the region. Resolving the conflict gold problem in Congo and the Great Lakes region will require concerted efforts by a number of actors, including governments worldwide, especially the United States, India, China, the United Arab Emirates, and in the region. International and local civil society actors, mining and refining companies, and artisanal mining groups must also play a role. But leadership by the companies that sell jewelry is an indispensable component to changing market demand to favor enterprises that promote peace and prosperity over those that entrench violence and criminality. The Enough Project has engaged with the largest jewelry retailers in an effort to encourage companies to use their power and resources in more robust, effective ways to support responsible sourcing in Congo and the Great Lakes region of Africa . To highlight leadership opportunities for companies that sell jewelry, Enough surveyed the 14 largest North American jewelry retailers through a detailed questionnaire and direct consultations. Our survey assessed what policies the retailers have adopted and which actions they have taken to counter the use of conflict gold. Enough found that two companies in particular—Tiffany & Co. and Signet Jewelers—have demonstrated clear leadership in beginning to address the conflict gold issue by taking proactive steps to set up supply chain controls, contribute to solutions on the ground in Congo, and support the communities affected by mining and violence in Congo. Other companies are starting to follow suit. 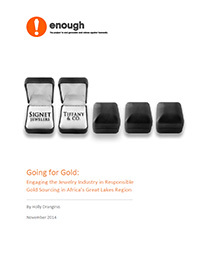 Cartier, JC Penney, and Target have distinguished themselves by taking important initial steps to implement more responsible policies, such as setting up requirements for their suppliers to source only from conflict-free gold refiners. Improve supply chain management and due diligence. Commit to sourcing from only certified conflict-free gold refiners. Join multi-stakeholder conflict-free sourcing groups. Invest in conflict-free gold sourcing initiatives in Congo. Invest in alternative livelihood and community development programs.